After arriving in Southern California in 1890, Garland helped drive much of the city's historic expansion in the first two decades of the twentieth century, and then, from 1920 to 1932, he directed the city's bid for the 1932 Olympic Games. His quest to host the Olympics provides an unusually revealing window onto a particular time, place, and way of life. Reconstructing the narrative from Garland's visionary notion to its consequential aftermath, Barry Siegel shows how one man's grit and imagination made California history. "Dreamers and Schemers brings alive a rollicking era when Los Angeles came of age, even as the world plunged into war and the Great Depression. What a remarkable tale. This is masterful storytelling." "Dreamers and Schemers is engrossing, outlandish, fascinating, and a reading delight. 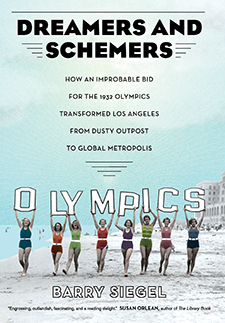 It pulls the curtain back on a great piece of LA history—the 1932 Olympics—and manages to tell the entire story of the city's rise. A pleasure for anyone who loves a well-told tale."